At least it gets me off the couch in the mornings. Truthfully, if I had my way, I’d spend all day on the couch eating bonbons and flipping through Imgur on my iPad, but the dogs aren’t going to let themselves outside and since our yard isn’t fenced (yet! ), I have to go with them. This involves piling them into the back of my minivan and driving out to the woods. See, I’d walk them around the neighborhood but there are too many potential pitfalls involved with this, i.e. other loose dogs. So my preference is to drive about five miles south on Walhalla Road, turn off onto any one of half a dozen “seasonal roads” and tromp around the Manistee National Forest for an hour. The dogs get to sniff and dig around, I don’t have to clean up after them (although I’ve unofficially adopted the first two miles of 6890 because, let’s face it, people are pigs), and we all get some fresh air and exercise. Sometimes we see deer, sometimes a dead snake, and once Roger thought for sure a cat walked out of the ferns not six feet in front of him, but it was a skunk and he was not allowed to get any closer to it although he fussed a bit about my decision. I held firm, though. You should see the divots my feet left in the road even two weeks later. I held on for dear life, I’m telling you. So how does this make me a better painter? It provides subject matter, of course. I won’t tell you how many pictures of my dogs are on my Google drive right now, but it’s a lot. Like thousands. Sometimes I keep my finger on the camera button, snapping pic after pic of Roger digging in the dirt just to get that one glorious moment when he leaps back into the road to try to catch up to whatever he’s smelling off in the distance. It lets me paint wonderful scenes of my dogs enjoying the great outdoors. I used to think I went out to the woods for me, but really, I go out there for them. They’re the ones that are having the great time. I guess I’m jealous. Here I am, covered in Deet to keep off the bugs and checking for ticks and bears and swiping at deer flies and those two are just loping along with their tongues hanging out, having a grand old time. Every. Stinking. Morning. I love it. I love them. I’m a lucky girl to have these lucky dogs. 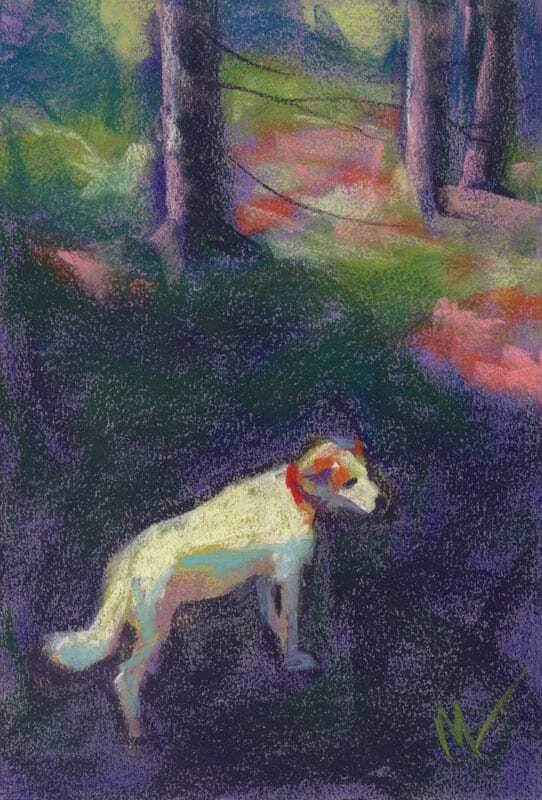 ©2017 Marie Marfia “Roger and Out” 6×9″ pastel on paper. ©2017 Marie Marfia “Daisy in the Dark,” 9×6″ pastel on paper. You can find more of my daily paintings on ebay including the ones pictures here. They start at 99¢ and the auctions last for 7 days. Good luck and happy bidding! 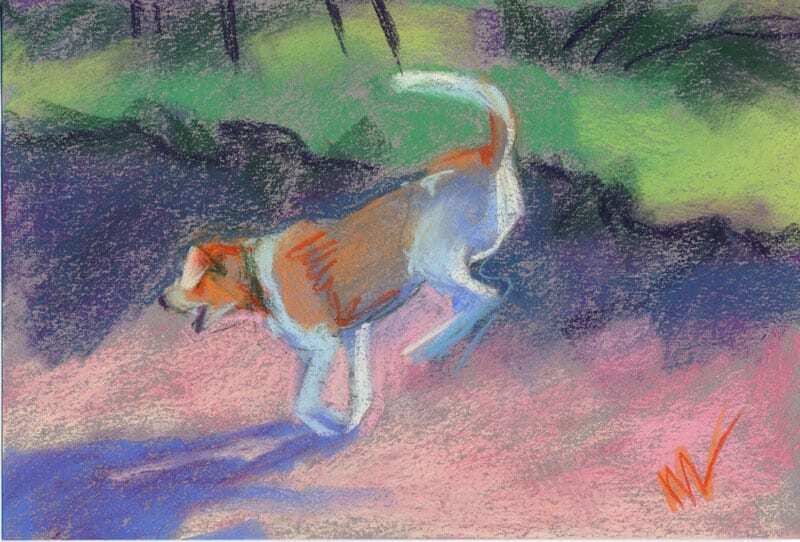 This entry was posted in A pastel a day, Animals, dogs, Landscape, painting a day, Pastels, Woods scape and tagged art, deer, dog, forest, landscape, manistee national forest, pastels, season road, skunk, trees, walking the dogs, woods, woodscape on August 11, 2017 by Marie Marfia.